Maple Leaf Farms Duck Bacon Wontons will help operators heighten their guests’ dining experiences and cash in on the growing fascination with ‘all things bacon’. Maple Leaf Farms, North America’s leading producer of quality duck products for foodservice and retail markets, has introduced Duck Bacon & Sweet Corn Wontons for chefs and caterers. The decadent blend of Applewood Smoked Duck Bacon, charred sweet corn and cream cheese fills a crescent-shaped wonton and is perfect for a small plate or entrée presentation. Inspired by chefs who enthusiastically embraced Maple Leaf Farms Applewood Smoked Duck Bacon introduced in 2012, the wontons allow restaurants to add a duck application to their menus that prepares in minutes and can be offered at an attractive price point. Since bacon captured the imagination of chefs and consumers the last decade, it has become a mainstay in our pop culture. “Maple Leaf Farms Duck Bacon Wontons will help operators heighten their guests’ dining experiences and cash in on the growing fascination with ‘all things bacon’,” said marketing director Cindy Turk. The Duck Bacon & Sweet Corn Wontons average 1.2 ounces and are packed in 25 piece trays – four trays per 7.5 pound case. They are the latest product in the Maple Leaf Farms “Introducktions” line of duck appetizers, which also includes Quesadillas, Potstickers, Springrolls and Duck Wings. 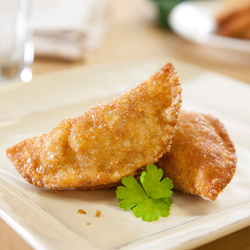 For more information about duck wontons, visit http://www.mapleleaffarms.com/foodservice or call 1-800-348-2812, option 2. Maple Leaf Farms is North America’s leading producer of quality duck products, supplying retail and foodservice markets throughout the world with innovative, value-added foods. Founded in 1958, Maple Leaf Farms is a fourth generation family-owned company.